When it comes to programmable thermostats, there are many benefits, including maintaining an ongoing, comfortable temperature within your home, creating convenience and most importantly, saving your family money while conserving energy. We recently shared how a digital, programmable thermostat can save the average homeowner 10 percent or roughly $180 per year on heating and cooling costs, making these accessories the ideal, green solution for every household. But, with so many makes and models on the market, how do you know which ones are the most optimal? While we have a lot of favorites, perhaps one of the hottest models is a Wifi-enabled option that provides convenience and comfort from virtually anywhere. 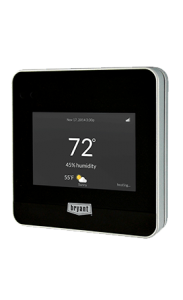 This article discusses the features and benefits of the Bryant T6 Preferred, Programmable Wi-Fi Housewise™ Thermostat and why we feel it’s a must-have for any home. This unequaled solution boasts a modern design, and leaves no stone unturned in the search for savings. In fact, homeowners saved an average of 20 percent on their heating and cooling energy costs. It’s a small size, and comes with user-friendly, smartphone-enabled touchscreen technology. Beneath the sleek appearance you’ll find Wi-Fi remote connectivity, detailed energy reports and the ability to utilize as many or as few advanced features as you want. All so you can enjoy energy savings, all while looking and feeling great doing it. Remote access via a web portal or smartphone app. Energy reports and customizable savings tips. Software that adapts beyond manual programming for greater efficiency, while meeting ideal comfort levels by understanding home and system characteristics. Smartphone view with a color touch screen. Indoor humidity sense and display. HVAC system alerts and maintenance reminders and displayed dealer contact information. Seven-day programming with guided scheduling, comfort profiles and touch-and-go features. Heating and cooling smart setback. Perfect heat pump system feature. Air circulation with minimum times. Free cooling with a ventilator. Window protection with a humidifier. Digital, programmable thermostats are great tools for the modern home, but perhaps one of the biggest reasons we love this solution is because it literally makes intelligent, money-saving decisions on its own. Using the smart recovery feature can automatically make adjustments based on your home’s heating and cooling gains and losses, changes in the weather and more. Additionally, the Housewise™ thermostat offers energy tips using specific usage information. This just leads to more enhanced savings that you can both see and believe. No matter what programmable thermostat option you choose, it’s a useful tool for ensuring that your heating and cooling systems are operating efficiently, maintaining a comfort level in your home while saving you money and offering peace of mind. If you have questions or would like to have a thermostat installed, call us today to schedule a free estimate.